This unit is designed using the Van Tassel-Baska Integrated Curriculum Model. This unit is designed for third grade, specifically gifted learners. However, this is easily adapted to suit the needs of higher elementary or middle school. The standards covered are ELA and Social Studies. The unit includes a unit design, unit outline, graphic organizer and planning tools, rubrics needed and four lessons (lesson one, six, thirteen and sixteen). The Change of Perspective: A Long Walk to Water unit will begin with the students developing an understanding of point of view/perspective. The students will begin by identifying the two perspectives found in the novel. The novel switches point of view throughout the narrative (differing in characters and time period). The students will develop a picture of who the characters are, as well as note the characters’ similarities and differences. Then, the students will examine how the two main characters’ point of views modify the presentation of events in the narrative. Then, the students will examine how the differing perspectives of the characters change the narrative (specifically focusing on the effect changing time periods has on the perspective of the two main characters). Throughout the unit, the students will evaluate their own perspective of the issues addressed in the narrative (activating background knowledge). During the unit, students will research Sudan. As the students research the context of the narrative, the students will examine how acquiring new information changes their perspective of the narrative. The students will distinguish their point of view from the two main characters of the narrative. As the culminating task, the students will examine how their changing perspectives shape their understanding or interpretation of the content. CCR Anchor Standard RL.6 – Assess how point of view, perspective, or purpose shapes the content and style of a text. RL.3.6 Distinguish their own point of view from that of the narrator or those of the characters. 3.H.1 - Understand how events, individuals and ideas have influenced the history of local and regional communities. 3.H.2 - Use historical thinking skills to understand the context of events, people and places. Changes in time, information and experience contribute to a character’s perspective of a narrative. Our perspective changes based on background knowledge, research and exposure to new information. How does perspective change throughout a narrative? How does personal experience and research change perspective of a narrative? Why is your own perspective of a narrative different from a character’s or narrator’s perspective? The students will determine how point of view shapes content. The students will determine how perspective changes throughout a narrative. The students will distinguish their own point of view from the narrator. 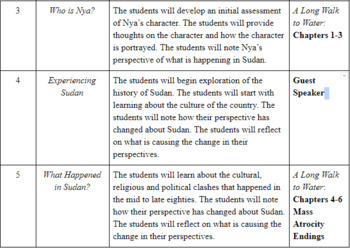 The students will determine how their own experiences and research change their perspective of the narrative.